Donegal’s winning of the Sam Maguire Cup this year represents one of the most remarkable triumphs in any sporting endeavour and a well-deserved victory for skill and effort, not to mention superlative management and vision by those in charge of the team. 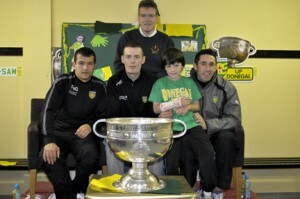 Pictured with the Sam Maguire Cup recently in St. Eunans GAA Club in Letterkenny are PMCA Managing Director Dr. Pat McCloughan and his son Eoghan (a keen footballer at U8 and U10 levels) together with members of the winning Donegal team (L-R): Frank McGlynn; Kevin Rafferty; and Rory Kavanagh. 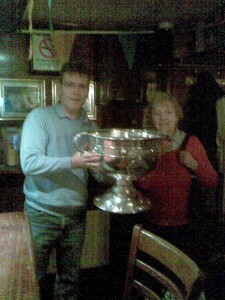 The picture below shows Dr. McCloughan with his mother, Rosemarie, with ‘Sam’ in Donegal on another recent ocassion.